I don’t believe in the concept of ‘heroes’ – all folk are flawed, and to elevate any one person above the common herd seems a sure-fire way of embracing deferred disillusion. But if I have a Lib Dem un-hero, it is our shadow chancellor, Dr Vince Cable: genial, sharp, magnanimous, dry, serious, courteous and formidable. Even to mention ‘Uncle Vince’ and his Tory counterpart ‘Boy George Osbourne’ in the same sentence is to compare mahogany with MDF. 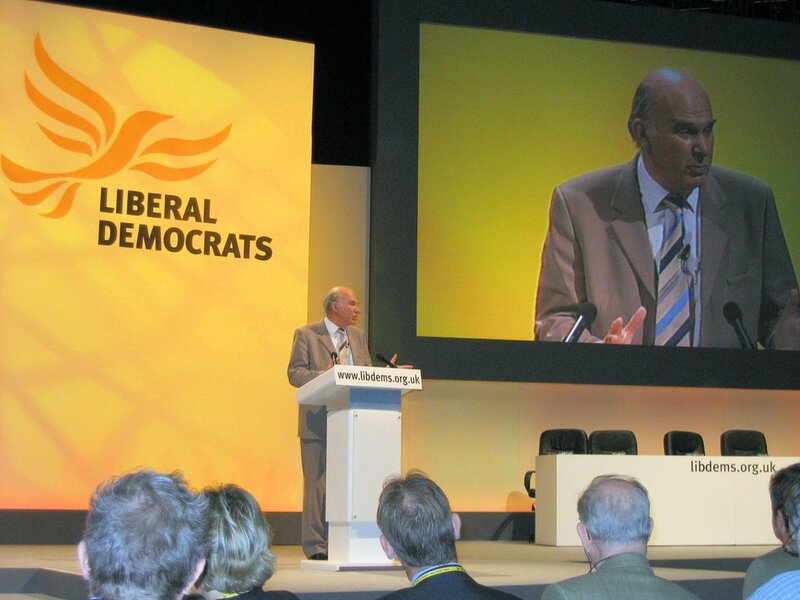 Today he took to the Lib Dem podium to deliver his speech to conference. Vince pulled off a neat trick. 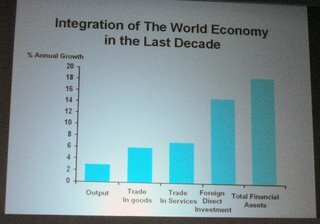 He delivered the perfect economics lecture, giving us a brisk tour de horizon on the state of the British economy, together with a slide-show of capsuled diagrams (as per the pic) – all of which graphically illustrated why one of Charles Kennedy’s best decisions as leader was to make Vince our Treasury spokesman. We saw an unholy alliance between the corruption and cynicism of the Bush administration and the inward looking protectionist instincts of a European Union dominated by the grain barons and orchestrated by Blair’s favourite spin doctor. At worst, their stupid selfishness could lead to the collapse of the trading system as it did in the 1930s when multilateral rules and solidarity were disregarded. 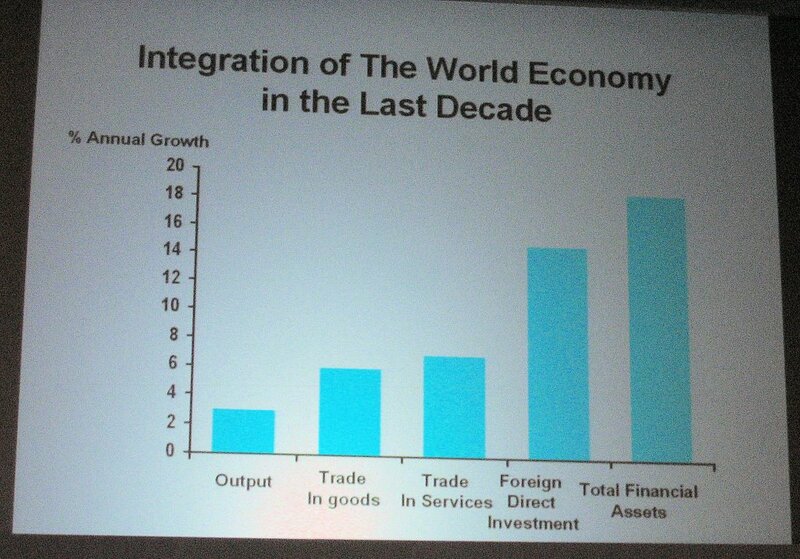 At best it will become much more difficult to manage peacefully and co-operatively the transition to a world economy in which the new powers of Asia reassert the dominance they lost over a century ago. In his speech yesterday, Charles Kennedy asserted the Lib Dems’ principled pro-Europeanism. Which is all well and good – but it should not stop liberals punching home the message that the EU’s unjust trade policies are deliberately and disgracefully condemning the developing world to continuing poverty. 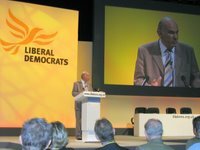 Yes, we should make the ‘case for Europe’ – let us never forget, however, that the Lib Dems are, above all, an internationalist party committed to free and fair trade.